All Acer devices that currently ship with Windows 7 and Windows 8.1 will support the free upgrade to Windows 10 that should arrive at the end of July. Acer announced earlier today that the company's entire 2015 Windows-powered product lineup that currently ships loaded with Windows 7 and Windows 8.1 is fully compatible with Windows 10. All these portables will support the free upgrade when it rolls out, starting on July 29. Maarten Schellekens, Acer's Vice President of Global Marketing and Branding, says "We’re confident that customers who purchased or plan to get an Acer Windows PC in 2015 will experience a smooth transition to Windows 10." 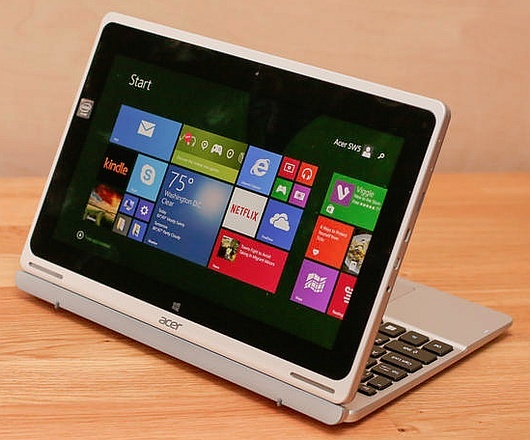 Acer obtained Skype for Business certifications for quite a few consumer and commercial notebooks. The official press release reveals that portables that use the Acer Purified.Voice technology "have proven in laboratory tests to improve speech accuracy scores up to 1.5 times with vacuum cleaner ambient noise, compared to models without Skype certification." It is also worth reminding that Precision Touchpads (PTP) are now present in both consumer and commercial notebooks by Acer. This technology allows a better user experience overall and is fully supported out of the box, without the need of any additional drivers. The full Windows 10-ready Acer lineup will be on display at the 2015 Microsoft Worldwide Partner Conference from July 12th to 16th in Orlando, Florida. Next to notebooks, the company will also show smartphones, tablets, convertibles, all-in-one PCs, as well as wearables and peripherals. Acer announces that its full 2015 Windows-powered product lineup and currently-shipping Windows 7 and Windows 8.1 portfolio will support the free Windows 10 upgrade 1 when it becomes available on July 29, 2015. “Acer’s diverse range of products designed for Windows 10 will be able to deliver its value to our customers across multiple device form factors,” said Maarten Schellekens, Vice President of Global Marketing and Branding, Acer. “We’re confident that customers who purchased or plan to get an Acer Windows PC in 2015 will experience a smooth transition to Windows 10.” "It’s fantastic to see Acer continue to deliver new innovation across its portfolio of Windows devices," said Peter Han, VP Worldwide OEM Marketing, Microsoft. "From Windows 10 devices to a Windows integrated wearable, Acer is delivering one Windows 10 experience across all of these devices for our joint customers." Skype for Business Certified Acer has obtained Skype for Business certification across its consumer and commercial notebook lines2, through fine-tuned hardware and software working together for a friction-free, optimized audio and visual communication experience. Skype-certified devices have gone through a rigid certification process to ensure that speech is seamless with no lag or gaps, the sound is reproduced true-to-life, and the video realistic and accurate. Acer’s notebooks with Acer Purified.Voice technology have proven in laboratory tests to improve speech accuracy scores up to 1.5 times3with vacuum cleaner ambient noise, compared to models without Skype certification. "Acer has made significant investments to deliver an exceptional customer experience across its portfolio. They've done some fantastic optimization of audio and voice, so the Cortana experience is delightful and works fantastically well," said Peter Han, VP Worldwide OEM Marketing, Microsoft. "With products from Windows 10 devices to Windows integrated wearables, Acer can truly deliver one experience across all these devices, and they'll work beautifully together enabling amazing Windows 10 experiences for our joint customers." Precision Touchpads for a Seamless Touch Experience Acer has widely implemented Precision Touchpads (PTP) on both consumer and commercial notebooks, allowing a unified Windows user experience across the touchpad and touchscreen, providing touchpad gestures and behaviors consistent with those of a touchscreen. Better accuracy is achieved through higher resolution hardware and built-in palm rejection, while all of this quality and functionality is provided right out of the box, with no additional drivers needed and settings easily adjustable through the Windows Control Panel. Acer Geared Up for the 2015 Microsoft Worldwide Partner Conference Acer will be showcasing its broad product portfolio with Windows 10 at the 2015 Microsoft Worldwide Partner Conference from July 12th to 16th in Orlando, Florida, with products ranging from smartphones and wearables, tablets, 2-in-1 notebooks, convertible notebooks, clamshell notebooks, all-in-one desktops and desktops, as well as monitors and projectors. Windows devices designed for both work and play, from the commercial and consumer product lines will be on display running Windows 10, including award-winning models such as the Aspire Switch 10 E 2-in-1 notebook, Aspire R 13 convertible notebook, TravelMate P645 commercial notebook, and Revo One RL85 mini PC. 1 Some hardware/software limitations may apply and feature availability may vary by device. Devices must be connected to the internet and have Windows Update enabled. Your Internet Service Provider may charge you additional fees. Should customers decide to approach an Acer Service Center to perform the upgrade, Acer reserves the right to charge for the service provided. The free upgrade offer is valid only during the first year of Windows 10 availability.